There are people in the world who believe there is no reason why humanity should eat animals, and they have a plethora of arguments to support this position. Not eating meat can benefit both the environment and health. Besides, in the meat food industry there is a lot of cruelty and the fewer people eat meat, the more it will reduce the suffering of animals. A vegetarian day is a day that respects all those who have decided to live a life without cruelty by removing the meat from their diet. The history of a vegetarian hug is related to the history of the PETA organization that founded it. PETA is an organization of "People for the Ethical Treatment of Animals", founded by Ingrid Newkirk in 1980 after being exposed for years to severe cases of animal abuse in a shelter for animals in which she worked. 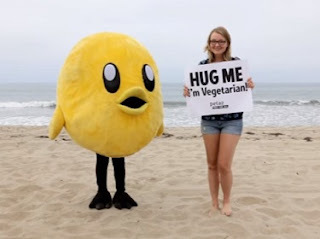 Hug a vegetarian day was created to show recognition and appreciation to those who have made the diet devoid of meat and life without animal products and their way of life. Being a vegetarian is not always easy, your menu becomes limited, and sometimes you encounter strange social hostility against those who choose not to consume animals. Since vegetarianism has become a popular nutritional move, the variety of vegetarian options in the market is growing and today it is relatively easy to find alternatives to meat. Many restaurants offer vegetarian dishes, many bags and shoes can be found from non-animal materials, and all thanks to these courageous souls who saved lives. It is the day to give them a warm hug and thank them for the life they saved and for their contribution to the world. How to celebrate the day of the vegetarian embrace? According to PETA, you should give a hug to any vegetarian or vegan you meet, and tell them that you thank them for the way they chose to live without cruelty and respect for animals.